My two acres adjoin the land of Point Reyes Station’s venerable Toby Giacomini, and one of the stockponds on his property is only 10 yards from our common fence. Living next to that pond for the last 30 years has been an education. Livestock such as cows and horses have long watered there, of course, but the stockpond also provides habitat for an amazing array of wildlife. 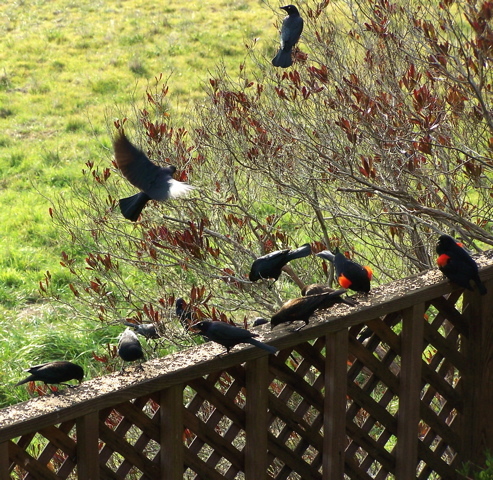 Red-winged blackbirds from a colony that nest at Toby’s Giacomini’s stockpond near my cabin flock in whenever I put out birdseed. Threatened Western pond turtles have found refuge in Toby’s stockpond. The pond provides a home for newts, frogs, snakes, various fish, and a colorful colony of Red-winged blackbirds. Deer, foxes, and raccoons frequently drop by for a drink. Badgers — and an occasional coyote — can be found around it. Here a Great blue heron picks its way through the reeds along the edge of the stockpond. Among the birds that can be frequently seen hunting for dinner at Toby’s pond are several varieties of duck. In addition, an occasional goose or two shows up although I’m more likely to spot them overhead. 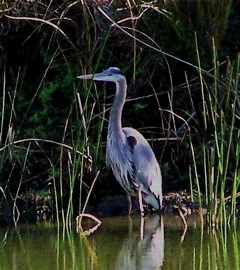 However, as far as I’m concerned, the true celebrity hunters are the Great blue herons. Having these long-legged stalkers around the cabin is exciting. I’ve lived in small, rural towns for 35 years, but I still get a thrill when a heron lands next to my parked car and then goes hunting in the field just below my deck. 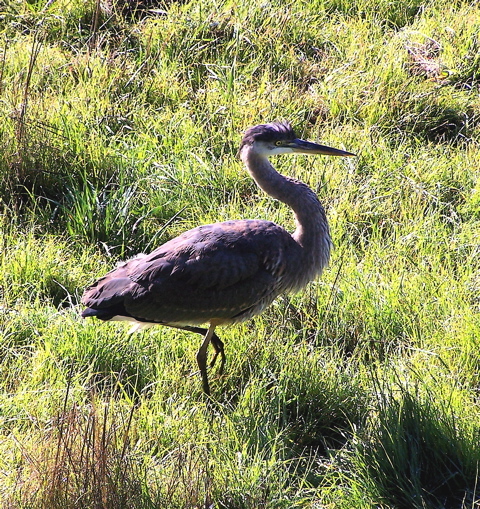 Great blue heron on the prowl in my pasture. For the sake of birds that don’t hang out around the pond, I provide a birdbath on my deck where these living dinosaurs* can drink as well as bathe. 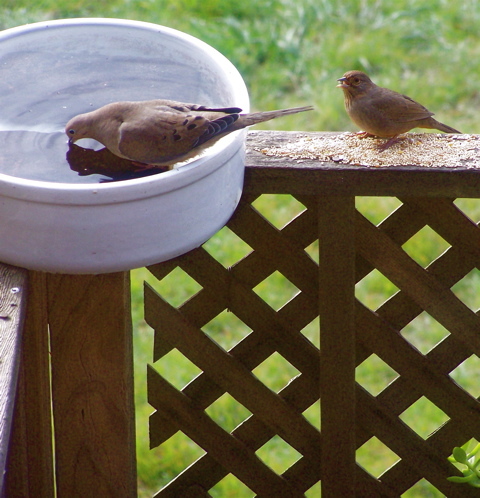 A mourning dove in my birdbath takes a drink while a brown towhee eats seed and waits its turn. “Well, I’ll be a dirty bird” — George Gobel (1919-91). 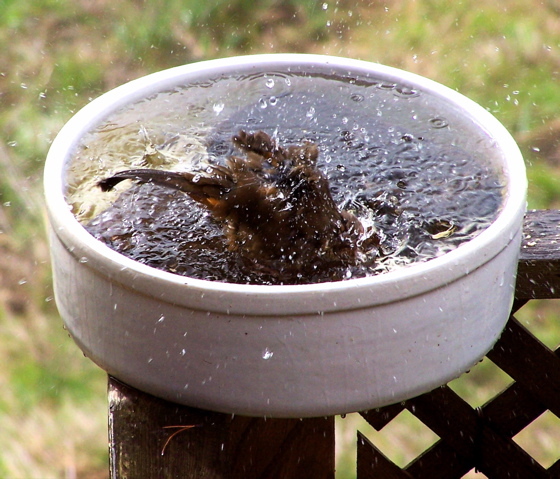 Splashing wildly, a brown towhee becomes practically submerged in my birdbath while cleaning up. Although not the only species to bathe on my deck, none do it with more enthusiasm than brown towhees. It so happens that I too like a good soaking now and then, and more than once while half-dozing in the hot tub on my lower deck I‘ve been abruptly awakened by a shower of cold water from a towhee splashing in the birdbath a deck above me. Gorgeous photos! The stop-motion of the bird taking the bath was great. And I loved the feeling of stillness of the heron wading in the shallows. They look so preternaturally focused – and then sudden as they jam their heads down and emerge with a fish. We could use some water down here in L.A. All we got from the “winter storm” was a whole lotta wind. Sparsely Sage and Timely is powered by	WordPress 4.9.10 and delivered to you in 0.484 seconds using 52 queries.